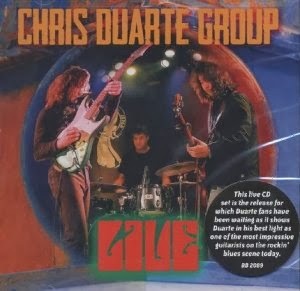 I just received the newest release, Live, from the Chris Duarte Band is it's killer. Hot on the heels of My Soul Alone released earlier this year, Duarte has put together a live set and it is terrific! You know how some bands are good on record but then fizzle live. Duarte is great on record and smokin' live. Opening with Freddie King's Hideaway, Duarte puts his own spin on a classic track and plays the crap out of it. Joined by band members Yoshi Ogasahara on bass and vocal as well as Jack Jones on drums this is a tight unit. Another classic, Big Legged Woman, is up next and we're talking funky here! Ogasahara and Jones really whip it up and Duarte plays what I can honestly say is the best guitar work ever done on this track. Frenzied, tight and innovative. Excallent! Ridin' is a fast paced blues rocker with a half tempo bridge showing a more progressive edge. This is hot... I mean hot! Junior Kimbrough's Do The Romp has a bit more meat than the original but maintains it's primitive nature. Duarte gives his strat a real workout on this track and Jones is deep into it. Make Me Feel So Right is a rollin boogie track with a Texas guitar drive. A bit more tame than earlier tracks on the release, it still gives you a healthy dose of rock and blues. Bottle Blues is down and dirty slow blues with terrific clean articulated guitar soloing. If you like that outrageous Texas style blues riffing (a la Albert King, SRV etc) you will absolutely love this track. Contrasting a whisper with a scream it got so hot that I had to turn down the air and crack a cold one! Let's Have A Party is a high energy blues rocker with plenty of fast paced guitar lead and double stops. Sit still and listen to this one. I dare you! Dylan's One More Cup Of Coffee is euphoric with swirling guitar sounds, the band exploring a number of different rhythm patterns, all of them equally interesting. This track may not be for the average listener but for the more sophisticated listener... I think it's a real treat! 101 feels a lot like Jimi with that drive and space. Duarte taks the lead of course but there are terrific bass lines throughout and Jones is relentless on the drums. Did I mention that this is a double disc release... disc one... outrageous! Disc 2 opens with The Best I Can Do, a driving rocker with a nod to the Everly Brothers vocally and Led Zep instrumentally...all twisted and Texas sounding. Nice! Satisfy has a real strong Texas blues lope to it. Duarte has been doing this guitar style since his first release and it always sounds great. In this case, there is also a pinch of country and a dash of Joe Walsh on vocal. Very cool. On classic Neville track, People Say, Duarte maintains a lot of the New Orleans feel and Jones helps to reinforce the funk. Duarte always does a real nice job on this track, this version being a bit more spartan that some I've heard. Again a bit more progressive instrumentally this track is very cool. On blues ballad, Hold Back The Tears, Duarte approaches more the folk or country rock arena but never letting up on the musical intensity. Sundown Blues, another track having a strong feeling of Hendrix in construction is an excellent foil for a 3 piece band. Duarte chokes every breath out of the guitar playing long Zappaesque guitar runs and crisp punctuating accents. Very cool! My Way Down, one of Duarte's best know tracks is up next with a funky Texas swagger. Sit back (if you can) and enjoy one of the current masters of contemporary blues smoke it. Like Eric is a great instrumental track reminding me a lot of early Billy Cobham with substantial forward drum work and jazz like blues riffs played on guitar. The only other band I can recall doing this successfully is the early Dregs. Great! Hard Mind is a cool 12 bar number with simple swing blues riffs played up front. Now mind you, this is a 9 minute track so the band has a strong opportunity to plays out some great riffs! Wrapping the release with John Coltrane's Alabama, Duarte again goes into progressive territory creating an entirely different world musically for the listener. I find this set amazing and will definitely be adding it to my best of 2013 releases. get a copy ... you can thank me later!